Kathleen A. Kelley concentrates her practice in litigation matters, including insurance and health care fraud and other complex commercial disputes. 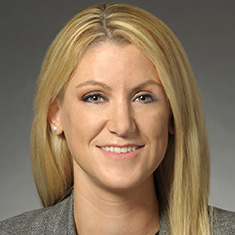 She has significant experience handling a wide range of federal and state commercial litigation matters, including cases involving alleged fraud, business torts, breach of contract, consumer protection class action, shareholder disputes, breach of non-competition and non-solicitation agreements, negligence and tortious interference. After graduation from the University of Illinois, Kathleen worked for a year as a consultant for a large accounting firm. She is a registered certified public accountant. While attending law school, Kathleen she served as an editor of the University of Illinois Law Review. She received CALI Excellence Awards in Real Estate Transactions and Illinois Procedure and Evidence, and the Rickert Award for Excellence in Writing. Kathleen also earned a spot on the Invitational Team and Moot Court Bench for the Frederick Green Moot Court, which became moot due to early graduation. Shown below is a selection of Kathleen’s engagements.